TSCM Specialist – Has Your Home Been Bugged? The signs that the security of your home has been compromised by a bugging device are often so subtle that they are easily missed. However, if you suspect that someone knows more about you than they should, it is time to hire a TSCM specialist and put a stop to the snooping for good. The most common sign that your home has been subjected to a bugging device is that you have been a victim of a burglary where nothing was taken. The only sign that someone has been in your house is likely to be a forced lock, an open window, or items around your home being disturbed or out of place. If this is the case, the first and most important thing to do is to stay calm and to act normal. While this might feel very difficult, it is essential so as not to alert the individual that placed the bugs. Try to continue with your normal routine while paying attention to the things around you; the more information you can give to the TSCM service you use the better. Listen out for changes in your home phone. If you experience changes in volume, or more static than normal when you are on a call, then there is a chance your phone has been bugged. The same is true if it makes unusual noises when it is not in use. Also, take a careful look around your home for items that just don’t belong. If you have recently received an unexpected gift, particularly an electrical item, then combined with these other factors it is definitely time to contact a counter surveillance specialist. If any of these sound familiar then use a phone or computer, away from your home and place of work, to contact Advanced Sweeping. We can get a TSCM specialist to you in a matter of hours and provide you with tips on how to stay safe in the meantime. 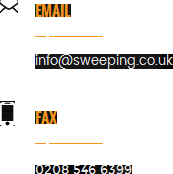 You can find out more at http://sweeping.co.uk/.